Jugnu is hot news today !! Yet another achievement for ISRO. 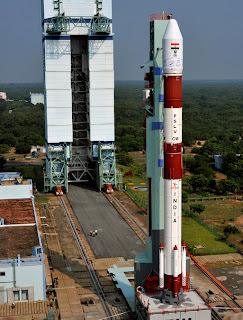 Today (a few hours ago) PSLV-C18, the Indian rocket carrying the Indo-French tropical weather satellite Megha-Tropiques and three other smaller satellites was successfully launched from the first launch pad at Satish Dhawan Space Centre at Sriharikota. The successful launching of Indian Polar Satellite Launch Vehicle (PSLV) designated C18 with its variant configurations, has proved its multi-payload, multi-mission capability in a single launch and its polar/geosynchronous launch capability. .
Polar Satellite Launch Vehicle [PSLV] is an expendable launch system developed and operated by the Indian Space Research Organisation (ISRO). It was developed to allow India to launch its Indian Remote Sensing (IRS) satellites into sun synchronous orbits, a service that was, until the advent of the PSLV, commercially viable only from Russia. 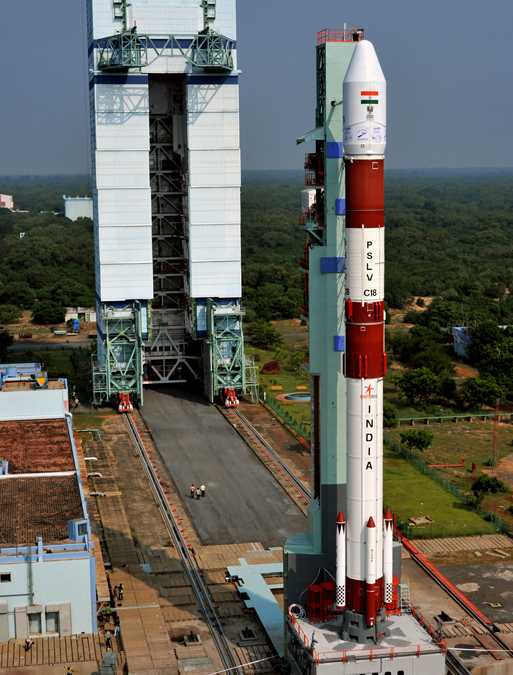 PSLV has been designed and developed at Vikram Sarabhai Space Centre (VSSC), Thiruvananthapuram, Kerala. The PSLV is a four stage (engine) rocket powered by solid and liquid propellants alternatively. The first and third stages are fired by solid propellant and the second and fourth stages are fired by liquid propellant. Today 12th Oct 2011 at around 11 am, on a bright sunny morning the Polar Satellite Launch Vehicle-C18 standing 44 metres tall and weighing 230 tonnes soared towards the heavens, ferrying the four satellites together weighing 1,042.6 kg. The launch marks the successful crossing of 50 satellite launch milestone since 1993. Heaviest amongst the PSLV-C18's luggage is the 1,000 kg Megha Tropiques, an Indo-french joint satellite mission for studying the water cycle and energy exchanges in the tropics. The satellite will provide scientific data on contribution of the water cycle to the tropical atmosphere with information on condensed water in clouds, water vapour in the atmosphere, precipitation and evaporation. The other three small satellites that were ferried by the PSLV-C18 were the 10.9-kg SRMSAT built by the students of SRM University near Chennai, the three-kg remote sensing satellite Jugnu from the Indian Institute of Technology-Kanpur (IIT-K) and the 28.7-kg VesselSat from LuxSpace of Luxembourg to locate ships on high seas. The nano satellite Jugnu weighing a mere 3 kg is designed and developed by IIT, Kanpur and is intended to prove the indigenously developed camera system for imaging Earth in the near infrared region and test image processing algorithms. Around 22 minutes into the flight the rocket first spat out Megha-Tropiques and followed it up with SRMSAT, VesselSat and Jugnu. The whole process got completed in 25 minutes from blast off. ISRO, with its network of ground stations, monitored its health. The PSLV rocket has now launched successfully 52 satellites out of 53 it carried - majorly remote sensing/earth observation satellites both Indian and foreign - and has been a major revenue earner for ISRO. The one failure happened in 1993 when the satellite was not able to reach orbit. This is the third successful rocket launch for ISRO this year from India. In April, the agency successfully launched remote sensing satellite Resourcesat-2 and two others. In July, communication satellite GSAT-12 was put in orbit. Thank you for sharing the latest news related to isro.I want to learn gis.Can you help me to crack GIS Jobs in Hyderabad.